On this fine day, with short pause from a hustle and bustle daily life for a while and sitting on a bench by the river to get past memory seemed like a good idea to me. I stopped by Dumulmeori (or Yangsuri). 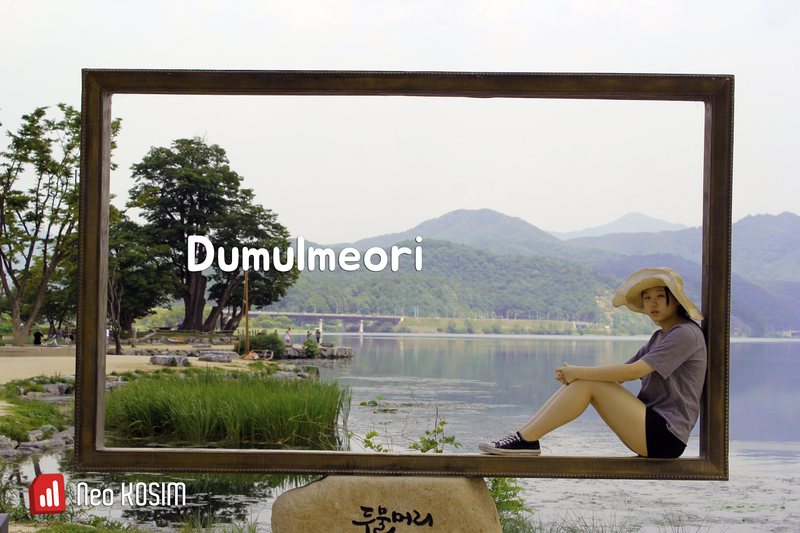 It is named as Dumulmeori because it is a place where two rivers meet. In the past, it was a quite prosperous ferry. A dam was built in the vicinity and here was designated as a Green Belt area, and it had resulted in stopping its function. The boat with an ochre sail is now silently telling past stories indifferently. Don't expect too much of here. It is a simple riverside area with nothing special. If I mention it, three trees of 400 years old are gathered side by side and look like an umbrella from a distance. And it has been bustling for visitors to make memories of their own at the zone recently installed frame to take pictures. However, the mediocrity and silence more than spectacular views sometimes let our hearts stick to it. The weather was heading towards summer and the lotus was full blooming. As sitting on a bench while watching the river without thinking and I was reminiscent of my memories with my parents when I was a child, high school campus and friends, college campus at this time of the past, etc. The book pages of Memories were turning over on and on to the past. It is a place often seen in dramas and advertisements, and the mist of the dawn is quite reputed to be beautiful in spring and autumn. Despite of depending on whenever it is, the atmosphere was great even if i visited in the daytime. I heard that snow in winter makes spectacular view but I'd give up to visit due to its cold weather. The bandit as for me seems to be the very right blooming season of lotus. Welcome to those who enjoy a secluded spot. Amazing place. Which drama was filming in this park? +AhuvaT It was 'The First Love' which was aired in 1996 Sep-1997 Apr at the last episode of this drama. "Heo Jun' which was the drama about the historical court physician in 16 C in previous dynasty. The vessel in the lake was used for that drama. The sunrise and sunset in this place are very beautiful and famous. Thanks a lot . Wish you would take a nice shot at here.